The alpha of the pack is often the largest, calmest, and smartest dog. They are highly cognitive (thinking) and have good social skills. If the alpha does not have these things then the pack dies out. The Alpha Eats First. This is true, but the alpha is also responsible for making sure the whole pack eats. In the wild it is more important for the alpha to survive than the puppies. It is easy to mimic these behaviors in your home. When you eat, the dog does not eat. This includes snacks. You feed the dog, and when you are done the food is put away. You don’t drop a food bowl down and let the dog eat on its own. Only The Alpha Gets Free Food. All dogs are born knowing this. Before the subordinate dogs eat they will submit, sit and wait, play bow, or stand sideways with their head lowered (ask permission). The alpha doesn’t demand this, it just happens. To be alpha in your home make the puppy sit/down and wait (change the length between 5 – 20 seconds for a young puppy). The food dish will go down, but when you leave the food comes up. There is never any food on the ground unless you are in the room. Only the Alpha Gets Free Affection: This includes kisses, pets, and play. All other dogs must ‘give a behavior’. In our homes this may be a trick, or obedience command. Alpha Dogs Sleep With Alpha Dogs. The alphas sleep with alphas. Puppies sleep with mother. Young dogs sleep with young dogs. If you see signs of dominance, bullying, or temper tantrums in your dog you must stop letting it sleep on your bed, or sit on the couch with you. This isn’t confined to dog behavior. You do not expect your boss to take you out to a fancy restaurant when he takes clients. But when you go home after 8 hours, the boss doesn’t complain that he has another 4 hours work on the computer before he is done. It is just how things are done. This is the same with the ‘roles’ in a dog pack. Everyone Follows the Alpha: Dogs are not off sniffing and exploring, playing, or resting ‘out in the back yard’ with no alpha present. The dogs are (almost) always in a position where they can see the alpha. When they sleep they lay so that they can see the alpha when they wake up. When the alpha sleeps – the pack sleeps. When the alpha moves – The pack moves. When the alpha stops – The pack stops. This behavior is born in each puppy. Through isolation, ignoring training, or treating a puppy as a toy or Fur Baby, the puppies lose this ‘anchor’ and go adrift in an ocean of emotions, fear, and anxiety. This also explains why dogs do not obey, or bully, their owners. If the owner is not the alpha then the dog has no reason to follow/obey. Everyone Works for the Alpha: Dogs have jobs in the wild, they protect, hunt, raise young, explore, play, eat, and sleep. 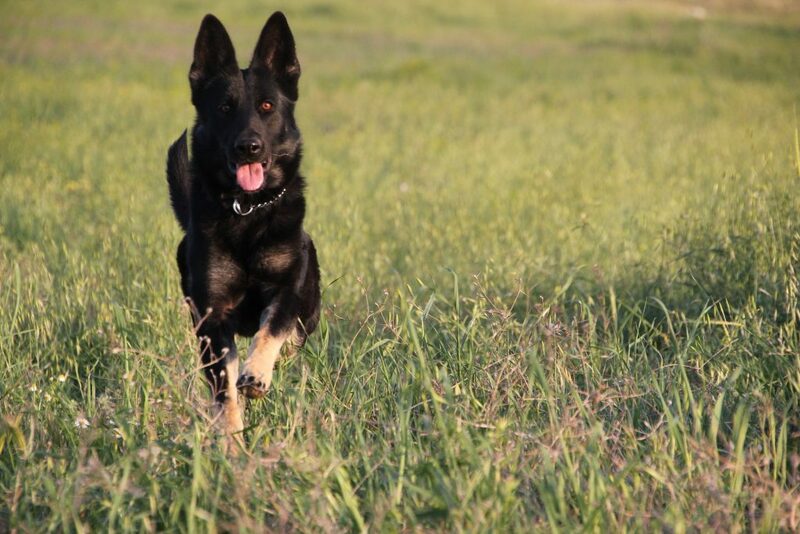 We have bred dogs to bring out certain characteristics, to protect, hunt, or be calm and do nothing. Dogs need to work. A dog that works is calmer than a dog that doesn’t work. Work is something that happens all day. It is not play time. It is not training time. It is work. It doesn’t need to be a job, or a sport. But the dog needs something that it can do, and that makes you happy. The Alpha is Dominant: Dogs have developed a wonderful way of establishing dominance. They push each other. It may only be 1 – 2 inches to the side, but the dog who backs up loses. This is all you need to do when your puppy is acting out. Just gently move it 1 – 2” to the side, or back up. If it is pulling on the leash, then take a step back. If it still pulls, then take another step back. When the puppy turns and looks at you (like it would the alpha) then praise it. What Happens When You Become Alpha? The change never happens over night. Sometimes your dog will fight you, after all, it had all the control. It’s actions, choices, and ‘wants’ effected how the family behaved. Just because you want it to change doesn’t mean that the dog wants to change. But, after it does you will find a happier, less reactive/anxious, and more obedient (compliant) dog. Some OCD behaviors may stop. Walking will be more enjoyable as your dog understands that you are going to deal with the scary things. Your dog will walk with you, and watch you, so it is paying attention to you, not being influenced by everything around the neighborhood. Demanding behavior will stop. Instead you’ll notice your dog sits and stares at you – now it is your turn to try and figure out what your dog wants. Or, for some fun, teach your dog ‘what?’ and let your dog show you. This is only a summary of the behavior. I suggest the first thing you do is learn dog body language so you can see what your dog is saying. Dogs listen with their eyes, so make sure you are connecting with your dog when you give it a command. The second thing you need to do is make sure that you set boundaries around your home. Yes, love your dog, but do it in a way that your dog will understand and can respond to, not in a way that will make your dog anxious. If this problem seems daunting then feel free to contact me. I can read your email and answer a few questions, or we can book a consult. Just remember – Every Dog Has Potential. Look Until You Find It.